You'll be £15.00 closer to your next £10.00 credit when you purchase How Churchill Waged War. What's this? When Winston Churchill accepted the position of Prime Minister in May 1940, he insisted in also becoming Minister of Defence. He was not going to play the chairman’s role, adjudicating between the competing claims of the ministers below him. He was going to get his hands dirty and take direct personal control of the day-to-day running of military policy. This, though, meant that he alone would be responsible for the success or failure of Britain’s war effort. It also meant that he would be faced with many monumental challenges and utterly crucial decisions upon which the fate of Britain and the free world rested. One of his first agonising decisions was how to respond to the collapse of France, and the danger posed to Britain’s survival should the powerful French fleet fall into German hands. When he ordered Admiral Sommerville to sink the French fleet at Mers-el-Kébir, he knew that France might be turned against Britain, but that act demonstrated to the world that he was determined to wage war ‘whatever the cost may be’. With the limited resources available to the UK, Churchill had to decide where his country’s priorities lay. Should he concentrate on the defence of the realm or take the war to the enemy – and where should any offensive action be focused? Should Egypt and the war in North Africa take precedence over Singapore and the UK’s empire in the East? How much support should be offered to the Soviet Union? How much of the direction of the war could he allow to be dictated by the United States? 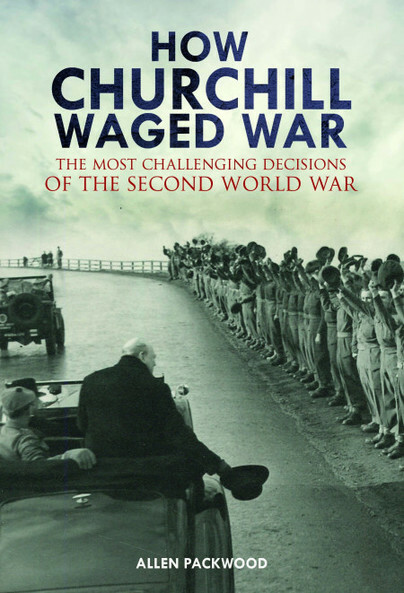 ‘How Churchill Waged War’ is not a biography; however, the reader shares the crowded and tempestuous moments with Churchill arguing, cajoling, encouraging and infuriating political colleagues, military commanders, allied leaders and family in this absorbing book. This is at once an ideal primer for those who are not familiar with Churchill and a must read for the serious Churchillian student. It deserves full attention as an Action This Day. Packwood’s scholarship is impeccable in documenting the story that he tells, rooting his conclusions in the impressive range of sources that he cites, often (but not always) from the Churchill Archives Centre. An interesting and well-considered study which makes an excellent contribution to both the study of Churchill as well as British strategic decision-making in the Second World War. One of the most pleasant aspects of reading this book is coming upon little-known material culled from the archives to illustrate well-known episodes in a fresh way. The Amery papers along with those of many other Churchill contemporaries such as Clement Attlee are housed at the Churchill Archives under Packwood’s superb leadership. After one reading, my copy of How Churchill Waged War is already heavily underlined and annotated. We must hope for more such books from Packwood displaying his mastery of the facts. Allen Packwood is the Director of the Churchill Archives, and he has used its magnificent resources to consider how Churchill made his strategic decisions in How Churchill Waged War: The Most Challenging Decisions of the Second World War. This is a wonderful book! Read the acknowledgements for famous writers such as Andrew Roberts and David Reynolds and you will see that all of them thank Allen Packwood when they write a book on Churchill or on the Second World War. Well now we have a book by the master himself! It is well-written, gripping and very exciting about some of the key decisions that Churchill had to make during the Second World War. It is based upon the author's long years of work in Churchill's own archives and is therefore completely authoritative. And fun! This is the definitive book on Churchill and the key decisions that he made in the Second World War. It is also affordable. He has spent years in the Churchill Archives and this book is the fruit of that dedication. Buy it! Drawing on his unrivalled knowledge of the archives, Allen Packwood offers richly documented insights into Churchill as war leader. A fascinating read. ALLEN PACKWOOD BA, MPhil (Cantab) FRHistS, is a Fellow of Churchill College, Cambridge, and the Director of the Churchill Archives Centre. Allen was co-curator of ‘Churchill and the Great Republic', a Library of Congress exhibition, which ran from February July 2004, and of ‘Churchill: The Power of Words’, a display at the Morgan Library in New York from June to September 2012. Allen has also organised many events and lectures, including the successful conference on ‘The Cold War and its Legacy’, staged over two days at Churchill College in November 2009, and attended by senior representatives from China, Germany, Romania, the Russian Federation and the United States. He is the author of several articles, co-wrote the publication accompanying the Library of Congress display, edited the recent guide to the Churchill Archives Centre, and has lectured extensively on Churchill in the United Kingdom and the United States.